A few years ago, I visited a small art gallery in Adelaide, South Australia. I turned a corner into an area off the main corridor and was stunned into immobility by a painting by an artist called Clifford Possum Tjapaltjarri. It was literally breathtaking, and the gallery owner said that my experience was common. He had even had one visitor (who he knew was very wealthy) stand transfixed as he said he would buy it without asking the price. 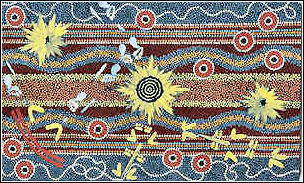 Tjapaltjarri died on 14th June, 2002, at almost the same spot where he was born 70 years ago outside Alice Springs, one day before he was to receive a national honour to recognise his contribution to the arts. His death was widely reported, but one aspect of the reporting disappointed me. An example is the story by the Australian Broadcasting Commission headlined "Leading Aboriginal artist dies". The disappointment comes from the emphasis on his racial background. All visual artists work within a social context and draw on their experiences, but ultimately the works have to stand alone. Picasso may not have been inspired to paint Geurnica if his personal experience and his country's history had been different, but nobody needs to know the background to be impressed by the painting. Salvador Dali created an outstanding series of illustrations for Dante's Divine Comedy, but, presumably, neither Dali nor Dante had ever actually visited Hell. It is quite possible, in fact, to appreciate the pictures without ever having read the book. To describe Picasso and Dali as "Spanish artists" is legitimate, because they both lived in Spain, but to attribute their talent to their Spanishness is nonsense. Similarly, the talent of Clifford Possum Tjapaltjarri could have made him a significant artist if he had lived in Sydney, Boston or London instead of Alice Springs, but his work would almost certainly have looked different. His paintings are within a genre, "western desert art", but they have an intrinsic quality which has nothing to do with who his ancestors were, and there was certainly nothing traditional about the materials used. They are, simply, good paintings, and nothing about the artist needs to be known to make this judgement. Every time that race is mentioned in a context where it is irrelevant it provides ammunition for those who would argue that skin colour and ancestry are important. I realise that the mentions in this case are well-intentioned and probably even meant to be encouraging to other Aboriginal artists and potential artists, but they are unnecessary and reinforce the stereotype that it is exceptional for someone from a particular group to achieve greatness. We can only beat racism by recognising that where there is no difference there is no difference worth commenting on. We would have been a lot closer to that goal if the headlines had simply said "Leading Australian artist dies".